As promised, The Rock And Roll Hall Of Fame announced their nominees for The Class of 2016 this week ... and I'll tell you what ... compared to the lists of recent years past (and as "all over the board" and "out of left field" as they've been in this area) ... it's really not a bad selection. Speaking of back-up groups, The JB's (James Brown's backing band) were nominated this year. I don't quite get this one ... Brown has been an inductee since Year One (1986) and a few years ago, The Rock Hall finally inducted some of the other famous back-up bands previously ignored when only the front man was inducted ... at which time The Famous Flames were recognized (along with Gene Vincent's Blue Caps, Bill Haley's Comets, Buddy Holly's Crickets, Hank Ballard's Midnighters and Smokey Robinson's Miracles.) It would seem to me that this honor has already been bestowed on the musicians most closely associated with James Brown ... which makes me think that the JB's probably won't make the cut. Another definite shoe-in this year ... Janet Jackson (how is it possible that SHE'S never been nominated?) Janet is one of those "obvious" overlooked choices whose name hasn't really come up much in this context ... but she is definitely deserving of the honor (and she's been eligible since 2007!) Certainly they've got to induct Ms. Jackson before Britney Spears becomes eligible, don't they?!?!? NWA should finally make the cut this year ... if only because their film "Straight Outta Compton" was such a HUGE success this past summer. (They've been on the ballot for the past four years and while I couldn't hum you a single note of a single song they've ever recorded, their "street cred" went up considerably this year thanks to the success of that film.) If they're EVER going to get in, this will be the year. It would be too embarrassing to ignore them now. The Steve Miller Band have been eligible for 21 years without ever earning a nomination. Yes, I still turn them off nearly every time they come on the radio ... but that's RADIO's fault, not the band's ... Classic Rock Burn-Out makes it almost impossible for me to listen to them today ... but they, too, have long-standing roots in the Rock Community. I've been a fan of The Cars since their very first release. In my opinion they helped define The '80's sound ... again very innovative and unlike anything we'd heard prior to that time. Their nomination is well-deserved. That leaves The Spinners (nominated for the third time) and fan favorites Deep Purple (eligible since 1994.) Deep Purple has come up as worthy candidates several times in our Forgotten Hits polls ... and this is also their third nomination. In that The Rock And Roll Hall Of Fame feels a need to focus on newer, more contemporary artists, don't be surprised to see either Nine Inch Nails, the Smiths or Los Lobos get a nod ... although I can't in my wildest imagination believe that ANY of these artists are worthy of such an honor or deserve the right to be enshrined alongside the likes of Elvis, The Beatles, The Rolling Stones, Chuck Berry or Little Richard. Still, I have to say that I feel pretty good about what I see on the ballot this year. Fifteen nominees and only a couple of groaners. If I had to pick the artists I feel most likely to make the cut, I would have to go with (in alphabetical order): Chic, Chicago, Janet Jackson, Nine Inch Nails and NWA. Any of the following selections (to round out the maximum of eight who might be elected this year) would be fine with me: The Cars, Cheap Trick, Chaka Khan, The Steve Miller Band, The Spinners and Yes. And one final plea ... please bring back the "Non-Performer" Category this year and FINALLY recognize Ed Sullivan for all he did to bring Rock And Roll Music into the living rooms of Middle America. I can assure you that FAR more people watched Ed's "Really Big Shew" on Sunday Nights to get their weekly fix of rock and roll than EVER heard Alan Freed on the radio. Don't get me wrong ... BOTH are certainly deserving ... but ignoring Ed Sullivan one minute longer would be a HUGE disgrace to The Rock Hall once again. Keep in mind, these votes are most likely skewed by the age group participating ... but seven artists already have over 20,000 votes ... with Janet Jackson and Chicago pulling in nearly TWICE that!!! Keep in mind, too, that for all intents and purposes the public has absolutely NO say as to who ultimately gets in ... but it's still kinda interesting to see which way the fans are currently leaning. The nominees were announced for the Rock Hall this morning. Thank God Mariah Carey is nowhere to be found!!! Our generation seems most focused on the induction of Chicago ... and rightfully so ... the fact that 21 years of eligibility have passed without a single nod just reinforces the gross misuse of power executed by the nominating committee. What today makes them more worthy of consideration than at any other time during the past 21 years? Ridiculous really ... but if The Rock And Roll Hall Of Fame is looking to save a little face this year by finally recognizing them, we're certainly not going to stand in the way. In my mind this is simply a case of justice finally being done. Forgotten Hits Reader (and lifetime fan and friend of the band) Tom Cuddy sent us this article from Syracuse.com who agree that after 48 years and 36 albums, it may finally be time to acknowledge their contribution to the rock and roll landscape. Note: Chicago, nominated for the Rock and Roll Hall of Fame today, was inducted into the Pop Music Hall of Fame in 2014. Voting for 2016 nominees for America's Pop Music Hall of Fame is nearing the halfway mark. Barry Manilow, Barbra Streisand and Sam Cooke are among the 2016 nominees. They join 11 other first-time candidates, as well as 11 returning acts to comprise the 25 artists on the ballot. Voting, at americaspopmusichalloffame.org, ends October 31. Nominees are selected by a national panel of musicians, disc jockeys and journalists based on the artists’ breadth and depth of pop hits, as well as influence. Through on-line voting, the public is choosing10 inductees; the national selection committee will add up to five other “Legacy” inductees. Inductees will be announced in December. In a ceremony March 15, 2013 with Johnny Tillotson as master of ceremonies, the original inductees into America’s Pop Music Hall of Fame were announced. They were the Beach Boys, the Beatles, Johnny Cash, Ray Charles, Nat King Cole, Perry Como, Bobby Darin, Neil Diamond, Brenda Lee, Johnny Mathis, Elvis Presley, Frank Sinatra, Bobby Vinton and Stevie Wonder. The 2014 inductees were the Bee Gees, Tony Bennett, Carpenters, Chicago, Buddy Holly, Elton John, Carole King, Dean Martin, the Monkees, Roy Orbison, Patti Page, the Platters, Simon & Garfunkel and the Supremes. The Monkees were formally inducted during a standing-room only presentation at the Monkees Convention in East Rutherford, N.J. on March 17, 2014. This year’s inductees were Paul Anka, Glen Campbell, Chubby Checker, the Eagles, the Everly Brothers, the Four Seasons, Tom Jones, Paul McCartney, Rick Nelson, Les Paul & Mary Ford. the Righteous Brothers, Linda Ronstadt, Johnny Tillotson, and Andy Williams. I never had the pleasure of meeting or the opportunity to see Billy Joe Royal perform live in concert ... but based on all the mail I've ever received over the years of doing Forgotten Hits, by ALL accounts, there's never been a nicer or more appreciative artist to take the stage. Billy Joe passed away on Tuesday (October 6th) at the age of 73. He died in his sleep. Royal hit The National Top 40 with his first three hits ... "Down In The Boondocks" (#6, 1965); "I Knew You When" (#12, 1965) and "I've Got To Be Somebody" (#33, 1965). Along the way he made songwriter Joe South quite a bit of money, too, as South penned all of these hits. Royal also recorded Joe's "Yo Yo" (#111, 1966 ... and later a #1 Hit of The Osmonds) and "Hush" (#48, 1967 ... and later a hit for Deep Purple, #4, 1968) ... along with several other tracks over the years. (In all, nine of Royal's 16 charted Billboard hits were written by Joe South. South would go on to have some hit under his own name in the late '60's and early '70's as well ... "Games People Play" reached #8 in 1969, "Don't It Make You Want To Go Home" went to #41 in 1969 and "Walk A Mile In My Shoes" just missed The Top Ten, peaking at #11 in 1970. South passed away a few years ago in 2012). In 1969, Billy Joe Royal had a sizeable hit with a "comeback" record of sorts when "Cherry Hill Park" climbed all the way to #15 in all three national trades. Ironically we had just run a letter from Forgotten Hits Reader Jim Foster, who was very excited and looking forward to seeing Royal (along with Felix Cavaliere of The Rascals, Joe Puerta of Ambrosia, John Cafferty, John Elefante of Kansas, Kyle Vincent of The Bay City Rollers and Ron Dante) perform at The Carl Perkins Civic Center in Jackson, Tennessee, this Saturday Night as part of the Kool 103 Caravan Of Stars concert . The very next day he was gone. Scott Shannon just announced that Billy Joe Royal died. Here's my favorite Billy Joe Royal song. I am sure you have heard of the passing of Billy Joe Royal yesterday. I will send you some concert photos I shot of him to use them on your blog. I'm sure by now you've heard that Billy Joe Royal passed away in his sleep on the morning of October 6th. I met Billy Joe Royal last year at another of the KOOL 103 Caravan Of Stars events. Without a doubt, he was one of the nicest performers I have ever met. He took the time to answer all of the questions I had, had great recall of memory regarding events long in the past, and didn't act like I was bothering him at all with so many questions. He loved every minute of it, and so did I. From everything I've read online, I've never seen anyone who ever had a bad word to say about him, and he never had a bad word to say about anyone else, either. That alone says what kind of man he was, and he will be definitely missed. CBS radio news just reported on the death of Billy Joe Royal at the age of 73. This is sad news. I had the chance to have him on the phone with me a few times, most recently in 2010. Attached is a cut from that talk about his biggest hit Down In the Boondocks. Tom also sent us this photo of a PAIR of Billy Joes ... B.J. Thomas with his pal, Billy Joe Royal, from a few years ago. My best friend Billy Joe Royal, died this morning. He was a sweet and talented man. Never a bad word. One of a kind. The Grim Reaper strikes the veteran music world again. I was terribly saddened to learn of Billy Joe Royal's death today. I can't profess to have known him well, but I was fortunate to have had the chance to meet and speak with him a couple of times when he enjoyed a career renaissance on the country charts in the 1980s. I'd been a fan of his '60s pop hits, so I was pleased to find that he was a truly nice guy -- quick to credit others with the successes he had had, and not one to play the blame game for the fallow years his career had experienced. Billy Joe came up through the Bill Lowery-managed, Atlanta-based stable of artists that included the Classics IV, the Atlanta Rhythm Section and Joe South, whom he cited as one of the most talented musicians and songwriters of all-time. In his words -- "I owe my career to him for 'Down In The Boondocks.'" He was a real music fan, and he clearly enjoyed talking about the artists with whom he crossed paths over the years, far more than about himself. Billy Joe said that he "still pinched himself" for having shared a concert bill with Sam Cooke on a few occasions, and he urged me to go home and play "You Send Me" back-to-back with Journey's "Lovin', Touchin', Squeezin'," citing his opinion that lead singer Steve Perry copped his style from Cooke. He was right. Billy Joe Royal died in his sleep Tuesday (October 6) in his North Carolina home at the age of 73. Born in Valdosta, Georgia, and raised in Marionetta, he made a name for himself first on his uncle's radio program and later on the Georgia Jubilee -- both while in his early teens. While performing in Savannah, he roomed for a while with Joe South, who asked him to record a demo of one of his tunes called "Down In The Boondocks." The demo was successful enough to land Billy Joe a contract with Columbia Records, who released the song as a single, reaching #9 in 1965. Other tunes by Joe followed, including "I Knew You When" (#14 - 1965) and "Hush" (#52 - 1967). He also is remembered for "Cherry Hill Park" (#15 - 1969) and a dozen other charted pop hits, before his star began to fade. Then Billy Joe went on to a successful country career, including "Tell It Like It Is" and "Till I Can't Take It Anymore" -- both of which were #2 on the Country charts. You probably know by now of the passing of Billy Joe Royal yesterday. You mentioned that your dad used to buy the Sunday paper on Saturday night to get a jump on the ads. I thought my parents were the only ones that did that. After going out for dinner on Saturday nights, my parents would get a Sunday paper being sold on one of the street corners. They would toss the paper to me in the backseat of the car. I would immediately take out the television guide and go to the tv listings for one week later. I always wanted to know what movie was going to be shown on SHOCK THEATER in one week. A couple more Billy Joe Royal tracks ... including his cover of a Paul McCartney song from 1970. A true talent ... no question! Sadly, that's an EASY answer....even if a very wrong one. Two words ... Jann Wenner. Sedaka is "too pop" for the Rock And Roll Hall Of Fame in the mind of Wenner. You don't have to publish this (and I do appreciate very much your posting many of my comments over the last couple of years), but watch that Calendar Girl video very carefully at the 2:23 mark, specifically where Neil's eyes go not just once, but twice! I did a quadruple take (a double take each time he gawked), wondering how that got by the censors in 1960. Even without that eye travel, it was already one of the most amazingly ahead-of-it's-time, pre-music-video era's music-videos, complete with pre-Hooters era Hooters girls. But with Neil doing that look up, that's an award-winner! Are you kidding me?!?! I've GOT to run THIS one!!! (lol) Scroll back down to yesterday's review and rewatch the clip ... and pay close attention to what Bill's referring to at 2:23. During the concert, after showing the clip, Neil mentioned how he and his wife (of 53 years) were sitting at an outdoor cafe having lunch one day when a woman came up to him and said "Neil Sedaka!!! I was January in your music video!" ... to which Neil said, "And she was a VERY, very old woman." John Fogerty is the latest rock star to publish a memoir. Fortunate Son: My Life, My Music hits stores and digital retailers Oct. 5th. He tells Rolling Stone that he was motivated by frustration at how he has been portrayed in the press. "I'd talk to a newspaper or magazine, and what I said never really came out right. In fact, it really looked bad in print when I saw myself complaining or anything about something. Finally I just said to myself, 'I'm gonna write a book.'" Work on the book began eight years ago with author Jimmy McDonough, who wrote the 2002 Neil Young biography Shakey, but Fogerty stresses that McDonough did not write the book. "Jimmy mainly acted as the interviewer. He said to me, 'John, this book is in your voice.'" The book reveals Fogerty's drinking problem, although he never terms himself an alcoholic. He tells Rolling Stone, "I certainly was acting like one. Everything I was doing was alcoholic. The only difference, I suppose, is that an alcoholic can't help himself. He's physically addicted, and if he has one drink, he'll go on a five-day bender. That's not the case with me anymore. I can go out to dinner with Julie and have a glass of wine and that's it. But I do want to say that I was psychologically addicted." As a lifetime John Fogerty / Creedence Clearwater Revival fan, it has often time been difficult for me to deal with the callous way Fogerty has continued to treat his former bandmates over the years. As such, I'm anxious to hear his side of the story ... because the tale as currently documented isn't always a very pretty one. We're really excited about seeing Brian Wilson perform at The Genesee Theatre next month in Waukegan ... and, based on this article from Beach Boys Examiner columnist David Beard, it sounds like Brian's having a pretty good time himself of late. 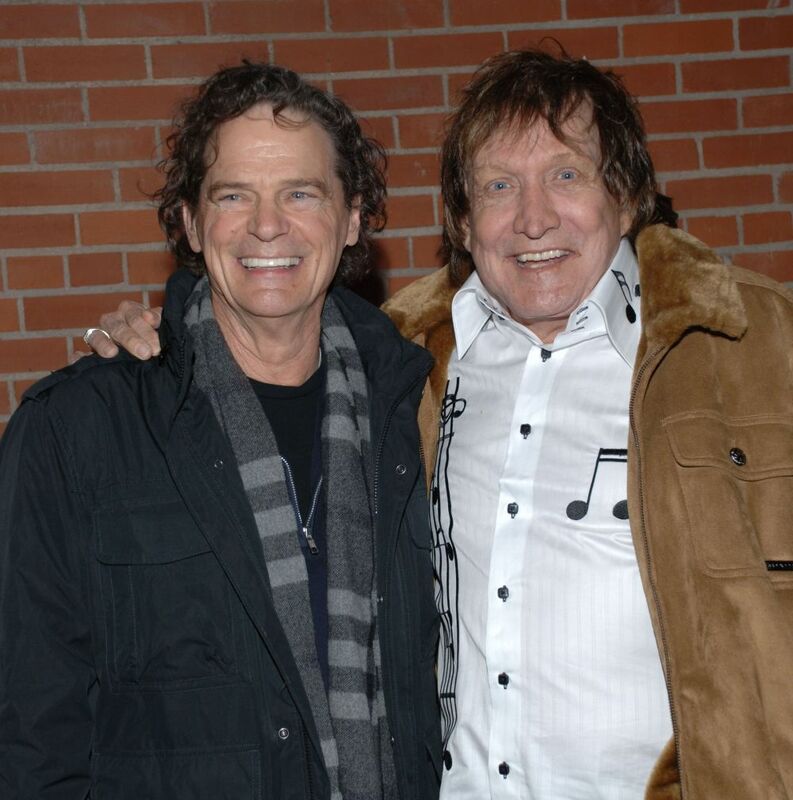 Sounds like in addition to Al Jardine, former Beach Boys Blondie Chaplin will also be onstage this time around ... and we will have JUST missed the chance to connect with long-time FH Buddy Billy Hinsche. Great seats still available at The Genesee Theatre box office ... and we'll have a couple to give away next week as well. Long time no write. Hope everyone had great summer. Just a quick note about "HippieFest" at the Genesee Theater (Waukegan, IL.) this past Sunday night. Friends had extra tickets and it was last minute chance to go without knowing who was performing. Rick Derringer opened and did a fantastic set ... his voice was strong and clear. Derringer and his fabulous band backed the next guest, Mitch Ryder. He was a riot ... really strong / clear voice and did all his hits ending with the "dirty" version of Little Richard's "Good Golly Miss Molly", and he absolutely shook the whole damn place ... high screams like he was twenty. Following Ryder was Badfinger's Joe Molland. He faithfully did most of Badfinger's biggest hits, and tore it up closing with "Come And Get It". Derringer came back with stunning capture of Edgar Winter's "Frankenstein" (Derringer is an AMAZING guitarist still). That had everyone (who can stand) on their feet. Closing things out was a true 60s gift ... The Family Stone featuring, one of Sly's daughters (I believe Phunne Stone), with an absolutely unbelievable voice, original drummer Greg Errico (I believe he's in the R&RHoF), and "as Sly", Alex Davis (wearing a floppy white hat and shades through the entire set, sounding scarily like Sly, sufficiently so, twas like watching / hearing the original S&FS.) They cranked out, Dance To The Music, Everyday People, Family Affair, Stand (I love that tune), and closed with an EXQUISITE Want To Take You Higher. The whole experience was unreal, and I screamed along until I had no voice left, and had no choice but to pull my wife in the aisle (along with many others), and dance! If you get a chance to see them, do!They have own site at: http://www.thefamilystonemusic.com/. Wonder if anyone else happened to catch this show and would like to share their thoughts. Thanks for the recent plugs for Record Research. I had a blast being on Ron Gerber’s radio show. After the show we gabbed for another 90 minutes off-air about our mutual love of the charts. BTW, that show is now a part of Ron’s permanent online archive and I highly recommend your readers check out some of his past shows. His tribute show to Casey Kasem in the summer of 2014 was a thing of beauty. One small correction though ... Ron’s first two 45s were “Le Freak” and “Y.M.C.A.”, and though I did mention buying those two records on the same day back in 1978, MY first 45 purchase was “Earache My Eye” by Cheech & Chong back in 1974! I’m not real proud of that fact, but I was only 8 years-old at the time and that record was the height of hilarity for me and my little friends. On another note, I visited the Rock & Roll Hall of Fame back in 2001 and had a great time. I agree with you that the actual museum is a must-see for any true music fan and that the nominating committee is a whole separate entity. Although Joel votes on the final ballot, I wish he was on the nominating committee as I’m sure he would lobby for many of the artists you mention every year. Heck, I think Joel himself should be inducted in the non-performer category! I’m a huge fan of Forgotten Hits ... keep up the great work! Check out some of those First 45's links I ran on the website ... they'll bring back a TON of memories as the times and tastes changed. (And there's a GREAT radio show hidden in there, too ... Scott Shannon played one a day for about two years on his True Oldies Channel ... read the letter and then play that person's first 45. With the volume of mail we've received on this over the past few years, it could literally go on forever ... what I call tune-in, appointment radio ... with the perfect blend of audience participation. Here is another gem I came across. It’s the Mischke Road Show http://mischkeroadshow.com/. This is a podcast done by former KSTP AM 1500 radio show host TD Mischke. Episode 67 is about the Nashville Cats, Nashville’s counterpart to the Wrecking Crew. He interviews one of the players about his time with them. Many stories about backing Bob Dylan, Elvis and others. Quite interesting. Episode 67 part 2 deals with William Campbell, the man that came up with the bogus Paul McCartney is dead saga. And he also interviews the man, who as an 19 year old kid becomes the Beach Boys manager. Two hours will go by fast listening to this. Mischke is probably one of the best interviewers out there. On his radio show he once interviewed a man that wrote a book on the sinking of the Edmund Fitzgerald, and sung all of his questions the man to the tune of the song. I think you and your followers will enjoy these. I wanted to let your readers know about this fantastic concert in Jackson, Tennessee, on Saturday night. This is my fourth trip and I wouldn't miss it!! The Hunts and KOOL103 in Jackson, TN always put on an amazing show. I hope to see everyone there! I am also looking forward to meeting and seeing you at the Chicago Cornerstones Of Rock PBS Special! John Cafferty: Original Lead Singer of The Beaver Brown Band - The Singing Voice of the songs in the Movie Eddie & The Cruisers: On The Dark Side; Tender Years; Tough All Over; C.I.T.Y. All VIP Seating Tickets include Meet & Greet Starting at 5pm! I know you (and I) are a stickler for “truth in advertising” concerning concerts. Concerning the Rock Pack concert, John Payne was not the lead singer for ASIA on any of their big hits. He was an addition after John Wetton left the band. Payne continues to tour in ASIA, while original members Wetton, Palmer, and Downes have toured as the “Original Members of ASIA”. Steve Howe recently left to devote more time to Yes and his own band, and was replaced by Sam Coulson. She is the cousin of Ric de Azevedo, who is the third voice in “The Reunion” of which Jim Pike and myself, formerly of the Lettermen belong. Tina is also the daughter of one of the “King Sisters”, as well as Ric. They both are (were) members of the famous “King Family”, who had a weekly ABC prime time variety show in the seventies for many years, along with Christmas specials after that for several years. The pre-RCA track you posted of Ronnie Milsap with the tune YOU NEVER HAD IT SO GOOD, I just now listened to online and I will say, it wasn't a bad tune at all. From what I could gather, the song was written by Ashford - Simpson and they did backup vocals on it. I was immediately reminded of something similar that happened to country artist Freddy Fender. He had a recording in 1960 called HOLY ONE on Imperial Records which made it into the top five here in OKC, more than ten years since he would become a household name on the country charts with a few crossover hits. Wow, doesn't sound anything at all like the Ronnie Milsap we all know and love! (More of a Chuck Jackson / '60's soul thing going on here ... which makes sense, I guess.) Amazing to think that he continued to pay his dues for another ten years before making his mark on the country charts. Nominees for 2016 induction into the Songwriters Hall of Fame in New York City have been announced. Country music nominees include Roger Miller (up against Marvin Gaye, George Harrison, and Jimi Hendrix) in the new category, Deceased Songwriters, while Tom T. Hall competes as a Performing Songwriter (against Madonna, Blondie, and Tom Petty). Nominees in the third category, Non-Performing Songwriters, include Dallas Frazier, John D. Loudermilk, Max Martin, Bob McDill, and Curly Putman. Seriously??? They now have a category for "deceased songwriters"?!?!? Hey, maybe that's how some of our "vintage acts" will finally gain induction into The Rock And Roll Hall Of Fame ... seems like they always wait until an artist passes before recognizing them anyway!!! We would SERIOUSLY like to plan an outing for next spring to have a group of Forgotten Hits Readers meet up at the Cleveland Museum. Count me in. It would be fun to meet with other musicologists and tour the museum. I was there about four years (took the megabus, cheaper then driving) ago. Maybe take in a sporting event, too, as all the stadiums are within distance.